Join us on Wednesday, January 30, at 8pm ET/5pm PT for this first webinar in our new national program, latinXfactor! Discover the beauty and strengths of your Hispanic heritage and learn to embrace and leverage your cultural uniqueness to succeed at school, in your workplace, and within your community. 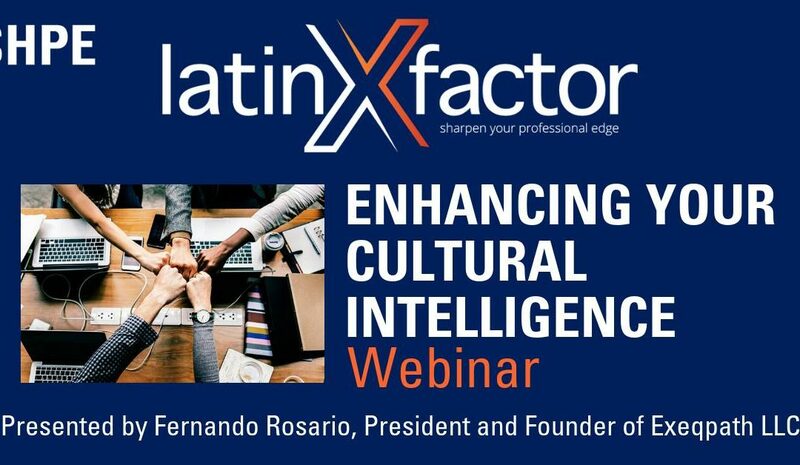 Executive Coach Fernando Rosario will lead this webinar specifically designed for SHPE members. Rosario will cover a variety of topics ranging from the impact of cultural stereotypes and cultural norms on communication to the role of gender and age in the workplace. He will emphasize the importance of understanding your own culture and biases as the key to better understanding and accepting those around you. Students and young professionals will walk away: (1) knowing that the culture they bring to the table is unique and valuable, and (2) appreciating that diversity fosters innovation and strengthens teams whether in school, the workplace, or the community at large. If you’re a student, recent graduate, or young professional, this educational program is for YOU. We hope you will make the time to join us at 8pm ET/5pm PT on Wednesday, January 30, and add your unique voice to the conversation.